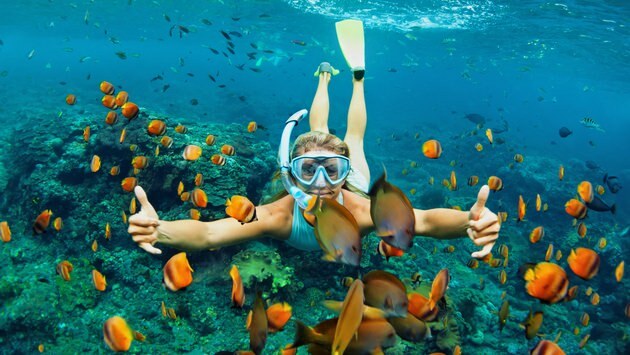 Nowadays, the enthusiastic of water sports like diving or snorkeling is increased among the society. This may be due to the level of stress that is rising with the work and atmosphere of the city, so people absolutely need to escape to nature as a solution to relieve the stress. If you want to get a satisfying experience in diving, it is advised to get a diving license from professional dive center. With a diving license, you will already be an expert in swimming underwater, so you can explore it freer and safer. Therefore, we can guarantee that you will find out amazing things while diving or snorkeling! Since the World War II, a lot of shipwrecks left under the sea in various places. Then this is used as an attraction and dive spots for divers all over the world, as it is fascinating to learn the history. The wrecks have also become an artificial reef that is a home for several kinds of marine biota, which provoke the divers to come over. This exploring activity can be a new challenge and thrill for divers too. Some of the famous spots for wreck diving are The Yongala (Australia), USAT Liberty (Indonesia), and Blockship Tabarka (Scotland). Surely it would be tense yet fun to swim when there are sharks around in proximity, the famed marine predator. Every diving area has different types of shark that wandering around, better if you find out and recognize the type of shark in the dive spot you will go to. For instance, Maaya Thila in Maldives is well-known as a home whale sharks while Beqa Lagoon in Fiji has tiger sharks as the trademark. Here are some useful tips to enjoy diving with sharks: do not panic and stay calm, use a large coral reef as a place of refuge, and do not make a move that attract the attention of sharks. Has it ever crossed your mind to glide with manta rays but during the night? It is very possible since a lot of dive spots now offer the unique experience. Kona Hawaii is one of the recommended places, where the manta rays can interact with the divers. They can approach the human and being friendly, harmless even though they are related to sharks and stingrays. The term of school of fish is intended for a group of fish that is swimming with the same direction in a coordinated manner. The purpose is for protecting them better from predators, getting their foraging in progress and to swim more proficiently. You can join this school only if you’re delicate and cautious, just get into it from the bottom to slip inside and feel the wonder from a unique perspective. If you like adrenaline, you can try to be casted by the ocean’s current where you can ride it and feel like flying. Palau’s Ulong Channel, Cozumel’s Santa Rosa Wall and the Bahamas’ Washing Machine are some dive sites with strong currents to try. Swim into the depths of a blue hole can be another alternative, where huge sinkholes or caverns frequently set in open water. Other than those mentioned above, there are more fun and challenging activities you can do while diving or snorkeling, especially if you have the diving license. Of course, this will be a relaxing and refreshing thing to do that can’t be experienced every day. Ready to discover more interesting things underwater and experience it yourself?